The first official game title for the 2010 Winter Olympic Games in Vancouver. 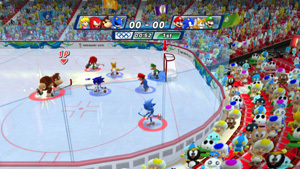 Characters from the Mario series and Sega's Sonic The Hedgehog series participate in all 16 sporting events from the Winter Olympic Games. Some sports can be optionally controlled using the Wii Balance Board. The new Festival mode allows the player to play through the entire Olympic Games, from the opening ceremony and every event until reaching the closing ceremony. As with the first Mario & Sonic game, Nintendo handled distribution in Japan while Sega published the game in the US and Europe.